Yes it's time for a brand new bontegame! Enjoy 40xEscape! Only one door, firmly locked, but have you got what it takes to escape? 40 times?! 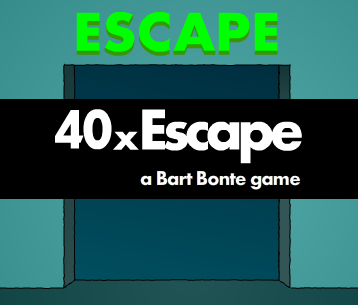 40xEscape was made for the Casual Game Design Competition 10 with theme 'escape'. First on a Bart Game. Very cool. ok. was blazing right along. fairly simple with good clues. then got stuck. you did it again, bart. lured me in thinking "aw, this is easy" then hit me with a hard one. haha! way to go bart back to the escape games! very nice game too. some challenging puzzles some very easy, a perfect mix. Done and done. Awesome game! Excellent escape game, Bart! I got stuck for a bit on level 35 but finally figured it out :) Thanks for sharing your latest creation with us! Fun! Some of the puzzles were too easy, but some definitely had me scratching my head. had an error on lvl 9 by using internet explorer. the light don't lit. Yay! Can't wait to play it! I'm getting an error on level 9 as well, even in Firefox. Nothing is happening at all. It's alright. It worked for me eventually. @Anon 5/9 9:01 - I used Internet Explorer and it works for me. Are you making sure that you follow the instructions? Bart, that was a fantastic game. It started off fairly easy, and then there were a couple of ones where I had to stop and think a little, and I loved the return of the bird! Fairly easy but liked the concept a lot, the yellow bird hopping about all the time is genius. Nice! I liked the simple design. I liked the puzzles. Most of all I liked the little bird, which I shall call "Anja". Thank you Bart and keep going! How can I do level 20? Great game. Some easy. Some I had to think hard about. Some I kicked myself when I realised what to do. I signed up to judge CGDC10, and this was the first game I tried. I have to say, I was not disappointed! Most levels were easyish, some I sort of fumbled through. For example, I got #19 in the end, but what was the logic behind it? couldn't believe my brain fart on #38! and totally loved the birdie! Fun escape game...entertaining as well, some are easy and others need the right thinking.I got stuck at levels 16 and 38 a bit. Thanks Bart! I'm so excited to play another game by you. stuck on 22. any help? I stopped at lvl 20 out of sheer boredom. That is a boring and repetitive game. To everyone that had a problem with level 9, I couldn't reproduce the problem, but I think I know what was causing it. There is now a new version online that should solve it. Could someone that had a problem with level 9 confirm this please? Thanks! Again with the sound... Bart I just love your games but I have to be able to turn the sound off. Everyone should have the choice to listen or not to listen. That goes for introduction sounds, background sounds and background music. You get a big thumbs down from me today. I'm not playing! Bart -I've never written before, but have loved your games for a long time. I don't understand how anyone could become bored with this game! It's wonderful - you make us think outside the box over and over, and that's never boring! I love this game! Thank you so much! OOOOOOOOOOOOOOOOOOHHH........... so that was why you dint post anything! You were working! yay! escaped 40x and bird went free! some levels were pretty tricky, but fairly simple. good game! y'all say that level nine don't work. but it worked for me. I love this one, I needed help on level 27 but got all the rest! the lvl 9 in the new version works now on internet explorer & firefox. Well, the little goof distracted me enough on one level that I was convinced you could only light a letter when the bird was NOT pecking on the side of the door. LOL! I can't seem to get rid of the rumbling Armor Games jingle thing? Fun and just what I needed today. A nice little set of puzzles. The bird was a nice little touch. Thanks Bart! Nice game! Some puzzles had unnecessary hints, while some were very vague...but this was fun and most of them were cool. Thanks! the "chick" was originally from:a bonte escape.fun game too. Not your masterpiece, sorry Bart! The game is a bit boring. Once started it's hard to quit, but tricks are not original and really predictable. Don't worry, I'm sure that a new and better game will be ready soon! Very fun, although could have been a little trickier and a little less repetitive. Thanks Bart! Nice respite. A bit on the easy side and repetitive but it's nice to have an easy game every now and then. Kinda copying 100 floors/exits? Do more and make them progressively challenging. Nice little escape. A couple of floors made me think for just a little bit...but I got it all by my onesies. Loved the game bart. It was 10:00 at night when I played it after a tiering day at school so I had to use a walkthrough on 4-5 of the levels. But thought it was good and KEEP GOING WITH THE ESCAPES BART!! lvl. 21 was difficult with a laptop!!!!!!!! Great game! Thanks for creating and sharing! Loved it! Some levels were really tricky, but I figured them all out on my own. Thanks for the great game. Thanks, Bart! Keep up the good work! I liked the bonte rooms, a bonte escape and free the bird more!!!! Correction to previous message: "looking forward TO". Fun! entertaining! a winner! cute! Excellent. I thoroughly enjoyed it! Same problem. My browser warns that jayisgames has been reported as an attack site. "We had an attack last night and so we took the site down immediately once we learned of the issue. The site has since been fixed and is now back online and safe to visit again. The malware warnings should go away soon, once the pending Google site review has been completed." So all should be fine now. Right you are! Site has a clean bill-of-health as I write this. Not bad. Only three or four took some real thinking, but all were amusing. I had to use your walkthrough for the 2nd half of the game. But I had been dieing for a Factory Balls 5. I made an example of 35 new levels on PowerPoint and should be sending it to you in a week. But yeah, nice escape game! I've always pictured a game like this and BAM! My thoughts come true. The game was the perfect birthday present, since it came out 2 days after my birthday. I need help on level 27. Awesome game! I love challenges, and I think this was possibly the best game in the history of the planet. am i the only nerd that tried to enter 29 factorial as the answer on level 29? Thank you for this game Bart. I've just come back after a long hiatus, your games are always that bit different and require lateral thinking. Thanks so much for helping my brain stretch a little! !